On February 4, 2019, Gov. Phil Murphy signed A-15, which sets New Jersey on the path to raise the minimum wage to $15 by 2024. The new law raises the minimum wage in increments, increasing the wage to $10 per hour on July 1, 2019 and to $11 on January 1, 2020. Thereafter, the minimum wage will increase $1 every year until reaching $15 per hour in 2024. The minimum wage will increase at a slower rate for small businesses with six or fewer employees, seasonal businesses, and farm labor. Also included in this bill is an increase in tipped workers’ minimum wage rates and a training wage. This Fast Facts helps employers understand when and how these changes are coming, and in what ways they will be affected. Between 2008 and 2016, legislation to increase New Jersey’s minimum wage was introduced five times. Three years after former Gov. Chris Christie vetoed the 2016 bill to raise the minimum wage to $15 per hour, a similar bill was signed by Governor Murphy, fulfilling one of his priority campaign promises. New Jersey has joined California, Washington D.C., Illinois, and Massachusetts as the lone states to implement pathways to a $15 per hour minimum wage. When does each wage increase take effect? As outlined in the table above, the first increase of the regular minimum wage will be implemented on July 1, 2019, with the other exempted wages increasing a year later on January 1, 2020 (along with the creation of the training wage). It is worth noting that the minimum wage will continue to increase based on the Consumer Price Index (CPI). If the CPI increase is higher than the minimum wage, the wage will be increased in conjunction with the CPI. Under the new law, the minimum wage for regular workers will continue to increase by CPI standards beginning in 2025, after the $15 per hour standard is met. For small employers (defined as having fewer than six employees) and seasonal workers, the minimum wage will increase each year by half the difference less than the regular minimum wage from 2026 to 2028. By 2029, the two wages will be equivalent. 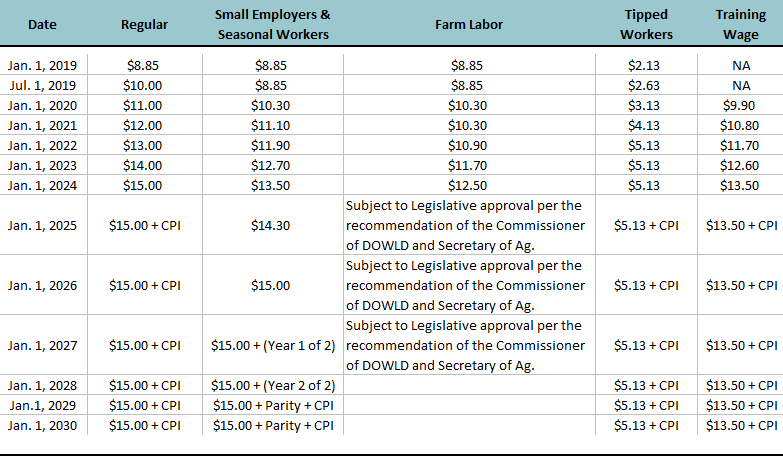 For farm labor the minimum wage will increase to $13.40 per hour on January 1, 2025, followed by an 80-cent increase each year until the wage reaches $15 per hour in 2027. The wage will then increase by one-third of the difference of the regular wage. By 2030, the farm labor wage and regular will be the same. Employees at summer camps, conferences and retreats operated by any nonprofit, religious corporation, or association are exempt from minimum and overtime rates during the months of June, July, August and September. Is there a training wage? An employee may be paid the training wage of not less than 90 percent of the regular minimum wage for the first 120 hours of work in an occupation in which the employee has no previous similar work experience. How are seasonal employer and seasonal employment defined? An employer which provides its services in a continuous period of ten weeks or less during the months of June, July, August, and September. An employer for which at least two-thirds of gross receipts were received in a continuous period of sixteen weeks or less during the previous calendar year. An employer for which at least 75% of wages paid by the employer during the previous calendar year were paid for work performed during a single calendar quarter. Seasonal employment is defined as employment by a seasonal employer, or employment by a non-profit or government entity only between the dates commencing May 1 and ending September 30, excluding farm laborers. How is small employer defined? A small employer is a company that employed less than six employees for every workday during the majority of workweeks in the current calendar year and less than six employees for every workday during at least 48 workweeks in the preceding calendar year. If the employer was established last calendar year, they must have employed less than six employees for every workday of that year, and for each workday during a majority of the workweeks in the current calendar year. If the employer was established this calendar year, they must have employed less than six employees for every workday for the majority of workweeks in the current calendar year. Wage order regulations can be found on the DOLWD website. If you need additional information, please contact NJBIA’s Member Action Center at 1-800-499-4419, ext. 3 or member411@njbia.org.